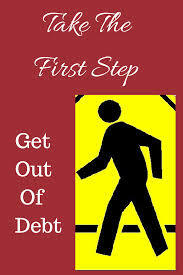 There are so many people that claim that they want to get out of debt, yet they don’t make the first step. They lament over their financial situation. They complain that they’re being held back and there’s nothing that they can do about it. They’ve heard about bankruptcy, but they really don’t want to go down that road. Many will do research online. Others will actually come in for an appointment and gain a ton of useful information about the process. Regrettably, only a small percentage of those people actually get the help that they need. Unfortunately, there are many reasons for this reluctance. First, many people think that their financial situation will somehow change without taking any sort of action. This may mean believing that creditors will stop collection efforts if they can just wait it out long enough and stall it out long enough. Others think that their income may increase based upon a future raise or a commission sales event or just plain good fortune. Others feel that they may meet a significant other that will bail them out of debt. And still others, refuse to acknowledge or accept that they even have a debt problem. Secondly, many people realize what type of help is available yet not wish not to take it. Some people feel that filing bankruptcy is a death sentence. Some people feel that they will never receive credit again or be able to buy a house or be able to purchase a car if they have a bankruptcy on their record. Others don’t like the stigma of having to admit that they filed for bankruptcy. Others are simply unaware of the facts surrounding bankruptcy filing and unaware as to how life could be after filing. What I have found as a bankruptcy attorney is that it typically takes a critical event to get somebody to move forward with the filing. In the case of a homeowner, this may be the onset of a pending Sheriff sale. For a vehicle owner, it may be the threat of repossession or an actual repossession itself. For others, it may be a letter from the Secretary of State notifying them that their driver’s license has been suspended. For many, it is a wage garnishment which will take 15% of their net income away every pay period. For others, it’s a frozen bank account that came out of nowhere and disrupted their financial situation. The good news is that for most people, bankruptcy is going to provide an incredible source of relief. It will literally stop collection efforts dead in their tracks. It will stop a garnishment immediately upon filing. It will most likely undo your driver’s license suspension. It’ll temporarily stop repossession or recover a vehicle that has already been repossessed. It will save a home from a foreclosure Sheriff sale provided the case is filee before the actual sale occurs. Nobody sets out to file bankruptcy. However when one looks at the benefits that can be achieved, it makes perfect sense to avail yourself of the federal law and either get a fresh start or reorganize your debt. If you or someone you know is struggling financially to the point where they need legal help, contact my office at 847-520-8100. The consultation is free and the information can be life-changing. Why struggle with debt. Learn your rights and make a decision that will benefit you and your family.